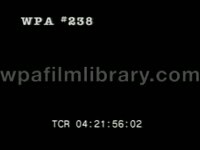 25 Years Ago - New Deal and WPA MS - The W.P.A. got under way, recruiting the first 15,000 for the New Deal's public works program. African American and Caucasian men. Recruit signs his name. Men work at construction. They have a wheelbarrow and shovels. Great shot of poverty during the Great Depression - CU African American man's feet, his toes wiggling to show off the tattered rags of (what used to be) his shoes. Excerpt from an unidentified b/w film depicting - in this excerpt anyway - westward bound depression-era family. This somewhat emulates the look of "The Grapes of Wrath" but it isn't. And it's definitely not documentary footage. MCU Two farmers talking, they shake hands, camera zooms between them to an International Harvester calendar on wall (Thurs., Sept. 21, First Day of Autumn); Dissolve to: overloaded truck driving trough and out of shanty town (camera follows); MCU family - young parents with two small kidsin the front cab; Grandma sitting on tailgate singing (she's not really on a truck, it's the magic of rear projection); dissolve to: truck driving through dusty desert; MCU Family in truck, similar to above but dusty this time; Grandma on tailgate again, dusty also. 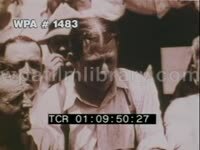 Master 1 - Tape 2 B/W footage, re-enactment of stock market crash, black thursday, 1929. Men inside a trading pit shout and wave their arms during crazed trading frenzy. Almost fighting with each other. Commerce. Finance. Wall Street. All of them start throwing their arms into a pit at once. Overhead bird's eye shot shows them like a geometric pattern, a la Busby Berkeley. Although billed as 1929 crash, could also be used to show early stock market activities. See catalog #492872 for entire film. Master 1 - Tape 2 Some 1930s depression scenes: People at a neighborhood grocery store/shop. A man (grocer/butcher) in a white apron hands a package to a woman. Sign: "Never Mind the Holiday. We Will Trust You". The man looks very satisfied with himself, happy, charitable. Cut to another sign: "You don't need money/WHAT HAVE YOU GOT?/We Will Take Anything." Man walks up to a butcher with a guitar case, presumably to barter it for food. Grocer inspects guitar. At 02:19:09: more shots: a street riot, violence, police try to control mob scene. A bread line on the sidewalk of an urban street. CUs of people in breadlines, both white and black. Old man with rumpled hat/clothes. The poor look directly into the camera, pathetic, beaten. FDR gives a private talk, probably a fireside chat. A house falls into a river (disaster, flood, collapse). Very striking angles on the poor, homeless: standing in lines, etc. Series of shots of work, 1930s/Great Depression. Work camps for the WPA (Works Projects Administration), could be prison camps. Lots of emphasis on african-american workers. Construction job, with tractors; possibly homes. Cut to construction in urban areas. Men in overalls pull planks of wood, saw on sawhorses. Women (again, African-Americans) file away 3 x 5 index cards. Secretarial, clerical, office. Line of women workers. Men and women sitting at desks, writing. A woman at a laundry hands some clothing to her boss. People at work, earning a living. Recovery from the depression. 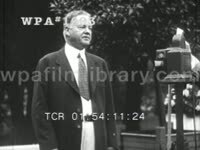 Sepia duotone footage, very early talkie style, of woman with fuzzy 1930s hair, about 60 years old, speaking directly to the camera about the need to support the President (Roosevelt) during the depression. Very brief shot of Father Coughlin at the end. 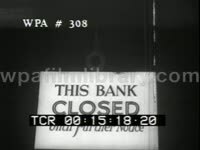 Depression montage: shots of man closing big gate and nailing up sign "CLOSED" CUs of signs "No Help Wanted" "No Men Wanted" "Closed" Shots of closed down factories, factories with For Sale signs. CU man's face as he walks down a city street. People are selling produce. Man with sandwich board signs "Will Take Any Job". CUs unemployed people standing around. CU sign "Public Notice: Wages of municipal employees suspended until further notice." CU sign "Mills to be sold at Public Auction." CU sign "Missionary Soup kitchen. VS men entering. High ang LS crowd of men stand in a long line stretching around a corner. MCU moving feet of men in line. MSs people get food at soup kitchen. Another line of people, mostly women and children. Sign at window "For Relief Only. Do Not Apply for Work Here" MCUs people being given packages of groceries. GV pasture scene. LSs group of farmers stand around listening to one of them speaking. MS angry farmer speaker. CUs men listening. MS farmers applaud speaker. CU man holds a handbill calling for a General Strike for sharecroppers, tenant farmers and day laborers. Var shots as the "Farmers' holiday association' organizes to block flow of farm products to cities. Farmer, some with guns. Farmers stop truck with milk cans and pour out all the milk. Archival B&W shots regarding The Great Depression: CU procession of feet on sidewalk; MSs people marching in bread lines; TLS people lined up 10-deep on sidewalk for length of a city block, a sea of Gatsby caps and long coats; MSs men in a shantytown (Hooverville) reading a newspaper; MS of horsedrawn wagon loaded with furniture driving away from a small shack; MS of farm children on back of wagon (Okies, Dust Bowl, migrants, farmers). Archival B&W shots regarding economic recovery from the Depression: tilt D shot of the Capitol Dome, stop at platform during Inauguration of FDR, 1932; MS of FRANKLIN D. ROOSEVELT on platform; TLS FDR riding in convertible during Inaugural parade; political cartoon, FDR as "doctor", Uncle Sam patient, array of bottles with "alphabet soup" names of New Deal agencies on them; TLS/MSs of men working on WPA projects, filling a foundation, digging sewer lines on city streets; MS FDR inking pen to sign a bil (Beer Bill, perhaps?). VO summarizes New Deal measures, conflict between business & government. LS of Wall Street building facades, businessmen in overcoats and hats walking down sidewalk to work, taxicabs and cars pulling up in front of banks. Still of Supreme Court Justices. VO says they strike down New Deal acts one by one. Shot of Washington Post front page, headline saying that the Court scraps the NRA and the Frazier-Lemke Mortgage Act. MSs Schechter's poultry store, lock on door, owners posing for camera outside (regards the "Sick Chicken" case of 1935). 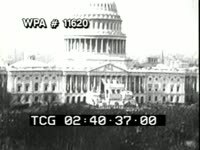 World War II: Prologue U.S.A.
Great Depression in America montage. African-American man looking at food displayed in front of grocery store. Young man looks at Employment Agency sign, 165 W. 131st St., NYC. Interior agency. A few men (both African American and Caucasian) waiting in line at window where clerk is hanging sign. Man at window with sign "No More Hiring" and clerk looking through bars. Unemployment. Master 1480 - Tape 1 MS white men and women hoisting & swinging filled beer steins while singing, celebrating repeal of Prohibition via FDR's Beer Bill. 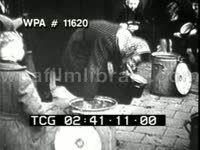 MS four unemployed white men squatting on street, eating hot meal & drinking coffee during Great Depression. TLS/LSs dilapidated wood houses & abandoned mills in rural farming communities and company towns during the Great Depression era, including one shot with a scrawny dog wandering along dirt road, passing by wood shack. TLSs white people standing in line to receive ration of coal; MS men wheeling carts or carrying sacks of coal. MS elderly Jewish man with long white beard pushing cart of coal across street, passing through crowd of pedestrians. Master 1495 - Tape 1 TLS/MSs unemployed white men loitering in public park, chatting, sitting or outright sleeping on park benches. MS U.S. President HERBERT HOOVER wearing gray business suit, standing against backdrop, talking to someone off-screen. CU U.S. President FRANKLIN D. ROOSEVELT (FDR, Franklin Roosevelt, Franklin Delano Roosevelt) delivering radio address. MS white man wearing Gatsby hat sitting on park bench & sewing pants (mending, stitching). MS jobless white man sleeping on front stoop. MS unemployed white man sitting hunched on park bench, head buried in his lap in sad, tired anguish. MS white man wearing Gatsby hat rummaging through garbage can on street. Low angle TLS NRA flag flying over sidewalk. TLS queue of white & some black men collecting slips from pass window. TLS white & some black men exiting building, congregating on stoop. 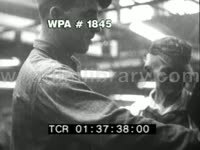 MS white male factory workers walking to work with metal lunch pails (lunchpail, lunchbox, pails); MS legs of workers walking to work (all the leather shoes); MS factory workers punching into work (time clock, punch card, clocking in, timeclock, punchcard). TLS/MSs bustling laborers on production floor of factory-- machinery, production, equipment, manual labor... alas, a labor union's dream! 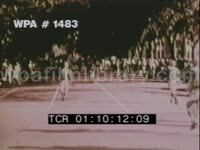 Master 1495 - Tape 1 LS white people standing, talking outside row of wood houses on Sunday afternoon. MS sign: "We accept food tickets and cash relief checks." Great DOF MS old white men sitting on curb with fellow unemployed men, talking. Sideview MS businessman J.P. MORGAN raising right hand to testify before investigative committee (might be congressional, and if so, this was shot in 1933). TLS Budget Director LEW DOUGLAS -- wearing wool business suit, fedora hat, carrying leather briefcase-- descending stairs of nice walkup home. CU member of FDR brain trust RAYMOND MOLEY posing for cam; note the shifty eyes. LS/MSs U.S. President FRANKLIN D. ROOSEVELT (FDR, Franklin Roosevelt, Franklin Delano Roosevelt) working with aides in office at Hyde Park home. MSs grim-faced President Roosevelt attending funeral of confidante Louis McHenry Howe in 1936; FDR stands beside wife ELEANOR ROOSEVELT & holds onto arm of young white man for support; MSs U.S. Navy sailors carrying casket to gravesite. MS unemployed white man wearing snap brim hat walking w/ body placard on street: "Unemployed." H/a TLS crowd (behold the plethora of overcoats & fedoras) standing outside employment agency office; MS job postings for waitstaff, dishwashers; TLS crowd outside Geneva Employment Agency. TLS white men filing into missionary soup kitchen; MS sign stating as much; MS soup being ladled onto plate; MS down-on-their-luck men filing past cam as they enter soup kitchen. MS President Roosevelt sitting at desk, delivering address (low audio): "You people must have faith. You must not be stampeded by rumors or guesses. Let us unite in banishing fear. We have provided the machinery to restore our financial system, and it is up to you to support & make it work. It is your problem, my friends, no less than it is mine. Together, we cannot fail." MS NRA (National Recovery Administration) flag hanging over sidewalk. MS NRA poster in window of Chase Safe Deposit Company. Panning LS long line of men standing in line in city, queue snaking around corner. MS young white male CCC (Civilian Conservation Corps) recruits handing papers to U.S. Army officers, boarding bus; TLS/MSs Rialto buses pulling away, eager boys waving & smiling. TLS CCC recruits setting up camp, making beds. Great head-on TLS crowd of white adults waving, cheering on street. Excellent extreme high angle TLS stockbrokers in pit; MS middle-aged white male stockbroker working frantically on floor of stock exchange. MS young white man wearing spiffy suit & fedora hat buying apple from down on his luck apple seller on city corner. MS artist drawing NRA poster. LSs large NRA parade in New York City. Coal Mining on a Budget aka "Steal This Coal Mine"
Master 1782 - Tape 1 LS crude coal mine & wood scaffolding. TLS white men working sluice-like coal chutes outside mine. Nice rear view MS three white male coal miners crammed into small, homemade wood cart entering coal mine; MS shirtless muscular white man leaning from jalopy car & holding cable attached to descending mine cart (rear wheel is used as a crude winch); CU "winch." MS white man dumping barrel of raw coal down chute. TLS white men shoveling coal along chute & onto truck. MS two white boys shoveling coal (child labor). TLS white men shoveling coal onto payload of truck. MS two white men climbing out of cart. VO: "Today the business of stealing coal has become a community enterprise. 25,000 men organized in crews of 4-12, using crude but effective homemade machinery, bring the coal to the surface. Other workers, both young & old, prepare it for market for $2-3 less per ton than legally mined coal." Title, "Historical Films 1125 (National Emblem, United States of America War Office) Produced by the Signal Corps, Musical The United States Army Band." "The Civilian Conservation Corps" "Acknowledgement is extended to the Department of Agriculture and Interior for scenes pertaining to the work of their departments." TLS decrepit factory, building. TLS/HA crowd of men crossing a barrier. MS man (Priest?) giving line of old white men sandwiches. TLS/HA crowd gathering in city square. MS men outside employment agency, sign, "Claremont, 1231 Employment Agency, one flight up, Female Dept." (Broadway in New York City?) MS "Geneva Employment agencies inc over 30 years of reliable service 1235" sign. MS men waiting outside employment office. MS boys waiting outside building. MS old white men sleeping in grass. (Homeless, hoboes, bums?) MS man giving speech in FG to crowd. MS police officers putting men in paddy wagon. 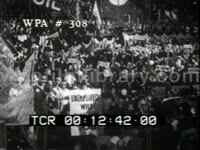 MS FRANKLIN DELANO ROOSEVELT (Franklin D. Roosevelt, FDR) speaking at podium, crowd in BG. MCU FDR at desk in black bow tie speaking. MS men laying in grass. ECU legislation that establishes the Civilian Conservation Corps, (CCC), "relief of unemployment through the performance of useful public works and for other purposes." ECU newspaper headline, "Labor Army bill passes House in stormy session, Senate will confirm Amendments today and measure got at once to President for signature, is predicted. Total of 250,000 men to get food, clothing and shelter..." ECU headline, "House votes reforestation pan to give 250,000 jobs; Farm bill foes overridden." MS man at desk answering phone. TLS crowd outside office building. MS woman w/ men waiting. MS/pan men outside building. MS young white men getting into truck, one smiles at the camera. TLS young white men in line getting food from pot. MS hungry men eating food. MCU man eating. MCU man pointing to dots on a map. TLS men waving as bus pulls away. Master 1487 - Tape 1 Excellent TLS African-American male construction workers running happily from wood-frame quartermaster shack immediately after getting paid (pay day, payday). LS black and white male laborers walking along dirt road campus of large construction site. LS black men working on construction site, throwing raw aggregate (rocks broken by man operating hydraulic jackhammer on screen right) onto bed of pickup truck. TLS black man operating steam shovel on construction site; load is filled with dirt and unloaded into adjacent dump truck. MS white man sleeping in doorway outside residence; MS men being served hot coffee in breadline. 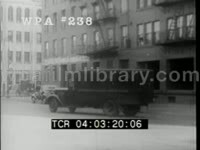 Post-World War One America and the Twenties Boom : TLSs parade for returning US soldiers (military bands, soldiers, fire trucks, crowds); TLS strip of townhouses in prosperous suburban neighborhood; TLS city street, a police officer directing automobile traffic with help of an umbrella on which is painted the words "Go" and "Stop"; TLS exterior of Monroe Clothing store, two American flags flying over entrance (patriotism). Post-World War One America and the Twenties Boom : TLS/MSs wealthy Caucasians crowding urban sidewalks (a sea of top hats and fur coats and formal wear, mixed in with trench coats and fedoras and knee-high skirts and floppy women's hats); TLS Ford Model T automobiles leaving factory, followed by MSs workers on assembly line, constructing cars. Post-World War One America and the Twenties Boom : Shots of ads using credit lines as a way of getting people to buy and live beyond their means; shots of American CEOs adorning covers of Time Magazine. The Stock Market Crash of 1929: MSs stock brokers on trading floor; MCUs price board at New York Stock Exchange; MS broker looking at board rather despondently; clips of newspapers reporting on the Crash, with headlines such as "Wall Street Lays An Egg". The Great Depression: LSs idle factories, smokestacks emitting no smoke; MSs unemployed outside employment agencies; MCUs Caucasian people looking at posted job listings. The Great Depression: MSs police officers handing out food to the needy on street. TLSs crowds waiting in breadlines snaking along sidewalks (a litany of long heavy coats and fedoras or Gatsby / newsboy hats); MS/CUs people in line outside soup kitchen. 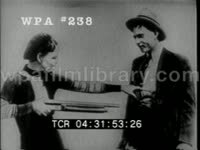 The Great Depression: MSs priest handing out money to line of men who doff their hats in thanks; CU shuffling line of patent leather shoes (feet); excerpt of newsreel depicting San Francisco-based relief worker Mother Jordan doling out stew with two hands to unending line of needy hungry men. The Great Depression: TLS/MSs men unloading crates of apples from truck, loading them onto cars and trucks, apple sellers on streets. The Great Depression: Agriculture, 1930s: TLS/MSs of foreclosure auction of farm equipment, Holstein cow; TLS/MSs farmers stopping car at roadblock, dumping raw unprocessed milk on road to protest price drop in prices. Master 1848 - Tape 1 TLS abandoned windmill sans cloth planes. TLS sand dunes dotting plain, abandoned farm houses in BG... the Dust Bowl. MS open window, broken screen of farmhouse. High angle TLS broken plow on dust, sand dune. MS/TLSs white male farmer using shovel to move dust, dig out path near farmhouse while two children watch on; rather iconic low angle MS boy and girl watching solemnly, wind whipping through hair. Panning TLS girl carrying metal pail along dunes outside farm house, loading item onto wagon. TLS white male farmer carrying two straightback chairs from house and loading them onto cart. LS Okies leaving the Dust Bowl. MS wood box on front stoop of farmhouse, two pieces of paper. TLS caravan of Okies taking right turn into camp. TLS white women removing furniture, belongings from wagon at camp. MSs iconic, grizzled Okie man in denim jacket and slouch-brimmed hat standing in dust, barren land; eventually kicks broken plow. MS white infant playing in dust by broken plow. MSs stock market ticker printing out ticker tape. CUs grain being poured into pile. MSs portly African-American male musician wearing tuxedo while performing on drums in nightclub, flashing giddy smile and banging out swinging rhythm on small splash-like cymbal. 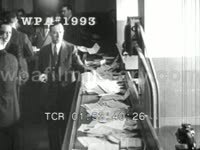 The end of the extravagance of the 1920s, aka the Stock Market Crash: MS stock market ticker printing tape, falling from table and smashing glass housing, tumbling to floor. FO/FI to high angle MS calcified skull and bones of cattle on parched, broken earth. MS Okie detritus on dusted land: discarded rubber tire, air pump, metal objects. MSs plow breaking rich grassy fertile soil, animal hooves pulling plow. MSs mustachioed white male farmer leaning against stopped plow, tilting back hat, pausing to admire land. 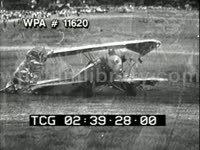 Nice archival footage. U.S. Depression scenes: unemployed men in line for food or work. CU/MS man scrounges through garbage. Truck with sign on side "New York Hunger Marchers Greet the Workers"; lists several cities such as Jersey City, Newark, Philly, DC, Baltimore, etc. ; "Carry on the Fight for Relief!" Shot of people standing around in street, some with signs. Geismar quotes Wolfe on the Great Depression. Shots of "Okies", homeless people; men climb out of a cave like primitive dwelling of bricks, rocks, etc. MS people sit on ground eating. People in a line. Men sitting in a row (on curb?) MS man on bench slumped forward, asleep or passed out. Another long line of men on a city street, with signs for Loans, a Technicolor movie sign in BG. Police dispersing a crowd from steps of govt building. MS man arguing with cops; his friends pull him away. MS / CU soup line in a vacant lot. CU young man eating. Animated map of Tennessee, Tennessee River, Tennessee Valley Authority (TVA) project, Wilson Dam, Norris Dam, proposed dam (Kentucky Dam?) across border. LS white male surveyors atop large earth mound, one man leaping across gulley. TLS surveyor working atop mound. TLS white men working in field, digging with shovels, using two-man hand saw. MS white male foremen and project supervisor conferring in field, looking over papers. MS claw-mouth of tractor shovel releasing load of dirt toward camera. LS tractor shovel releasing dirt onto mound, two mules standing tethered to cart in FG. LSs late stage hydroelectric dam construction, water detention. Traveling LS mid-stage dam construction. TLS water rushing through dam. Master 1482 - Tape 2 Great high angle traveling shot (overview) hydroelectric plant, men shine-cleaning equipment and mopping floor. LS completed, operational hydroelectric dam. LS/TLSs men working atop electric distribution tower (transformer, electric grid). Panning LS electric distribution project, electric cable being unspooled in FG. TLS white man drawing electric cable to rural farmhouse. Low angle MS white man waving from atop telephone pole. TLS/MSs white men hooking farmhouse with electricity, installing electric meter outside house. TLS/MSs dispossessed Caucasian men jumping trains, riding the rails; groups of haggard hungry dirty desperate men hitching rides on boxcars and flatbeds; the hobo mystique; TLS African-American man (hobo) getting off moving train. 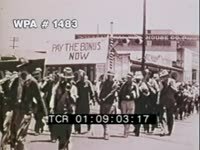 Bonus Army. WWI veterans, some in uniform, march past U.S. Capitol building. Police stand guard. Tanks on street. Mounted U.S. Army troops disperse protesting vets. Protesters suffering from tear gas. Good shots of the Bonus Army's shanty camps being burned, including cloud of smoke over the Capitol. Secretery of Agriculture Henry Wallace at work, with others. AAA, Agricultural Adjustment Administration. MCU map showing types of farming in USA. MCU Secretary of the Interior Harold Ickes, Public Works Administration (PWA). CU draftsman draws line with triangle. Pan up to show large drafting shop. MS Secretary of Labor Frances Perkins (first woman Cabinet officer) meets with others. Department of Labor offices. Graph showing employee turnover. GV House of Reps. Various shots showing work of government: meetings, offices, blueprints, men working at desks, worker at wall of files. Works Progress Administration (WPA). Var shots men start to work, taking wheelbarrows, shovels, rakes. Sign: "USA Work Program WPA". 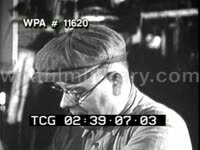 Var shots of WPA workers at work. Anti-WPA cartoons depicting WPA workers as lazy, getting hand-outs. Various shots of one of the biggest WPA projects, the Tennessee Valley Authority (TVA), shots of dam, water being let through, electric power plant, electric power lines etc. Civilian Conservation Corps (CCC) a work program for youth, in which young men were sent from cities where there were no opportunities for them to work camps. Var shots of CCC workers chopping trees, sawing lumber, building telephone poles, planting trees, etc. Dust bowl: var shots of dust storm. Woman picks up toddler & runs into house. A woman and a boy in blowing dust. MCU farmer picks up handful of dust. Shots of cow and mule looking for food or water. Various shots of people loading furniture onto trucks, abandoning homes. Farmer lifting kids onto truck. Pan on abandoned things, broken chair, broken doll, etc. Various shots of "Okies" gathering together in camps while on their way west. One trailer says "No More Dust Bowl." Man mending a tire. Girl sleeping on blankets on the ground while mother washes dishes. Var shots of kids in the Okie camp. MS man sits on ground smoking. The men were no longer farmers, they were migrant men. TLS/HA CCC camp. MS buses & trains approaching camera. MS men getting off bus & train. MS man giving young men papers. MS young men following leader. TLS men entering tents. MS entering tents. MS man in desk looking at something as men stand over. MS men walking, entering tent. MS men getting supplies, tin cup. MS men entering barrack. MS young men in line for physicals. MS men standing around, bored. MS men in line at "Discharge Office." MS men raising hands. TLS men running out of tents. MS boys, young white men running out of ten w/goofy grins & tin cup & plate in hand. MS men entering mess hall. MS being served food from pots. MS eating at table, food steaming. MS man being given supplies, blanket. MS boy going through box of supplies. MCU man measuring boys foot size. MS boys passing in line by camera. MS entering building, given coats. MS exiting building, rucksack over shoulder. MS boys making beds. MS standing in front of supplies. MCU smiling boys. MS men w/shovels walking. MS working w/shovels. MS young white men getting on train, (Pullman Car) waving as leave. TLS train moving. TLS scenery from train. MS young white men getting off train, African American, black porter stands outside. 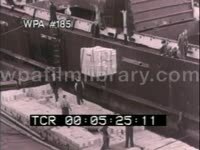 MS unloading train. MS walking. TLS city, trucks crossing intersection. TLS CCC camps. MS camp construction. TLS construction, camps, evergreens in BG. (Yellowstone National Park) MS in truck. MS mountains. MS men working along a lake. TLS camps in FG & beautiful mountains in BG. MS workers clearing brush. MS men using picks, waterfall in BG. TLS waterfall. MS men using picks near base of waterfall. TLS OLD FAITHFUL spewing water. MS car entering camp. MS FDR w/HENRY AGARD WALLACE in backseat. MCU FDR seated, smiling & talking genially. Great Depression montage: low angle MCU factory smoke stacks; CU "closed" sign posted on factory gate; CU sign reading "No Men Wanted"; MCUs unemployed men seated on bench; MS unemployed men w/sandwichboard reading" Unemployed will take any job"; Elevated GV of men shuffling in bread line; CU male feet walking. Montage of hydroelectric dams built during NRA/WPA days: Areials of the winding Tennese River; MS water rushing along dam wall; MS sign reading "Chicmamauga"; GV Chicmamauga dam; CU sign reading "Pickwick Landing:; GV pan of Pickwick Landing; MLS Guntersville Dam; GV Wilson dam; MS pan up wall of the Norris dam. MCU FDR at desk about to open Norris dam via telegraph; CU finger pushing telegraph key; CU General Electric gauge; MS/GV water rushing over dam wall. 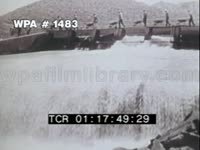 Montage of hydroelectric dams built during NRA/WPA days leading to industry: Traveling shot past dam; CU equipment spinning; GV/MS allumunum factory; CU/MS timber logs; CU log being cut by saw; CUs various machinery in action; MS/CU farmers dumping grain; low angle GV dam wall. Stock Market Crash: High angle LS trading at NY stock exchange. MS/MCU frantic traders waving arms & shouting. MS Hoover. Unemployment (Great Depression): MCU pan of chain-link fence to sign reading "No Men Wanted". MCU man hammering "Closed" sign to wooden fence. MS man hanging "Closed" sign on chain-link fence. MS man walking along city street w/sandwich board reading "Unemployed Will Take Any Job". Low angle CU of unemployed men walking in line w/heads lowered. MSs Herbert Hoover making public address regarding unemployment (natural audio) "And therefore I would say to the American public, be patient, be helpful, recognize the complexity & difficulty of the problem...."
Bonus Army march on Washington, DC, 1932: TLS/MSs WWI veterans marching, arriving in trucks and cars; MSs USMC General SMEDLEY BUTLER (retired) speaking to the Bonus Army. 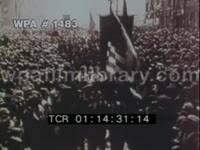 Bonus Army march on Washington, DC, 1932: TLS crowd cheering outside the Capitol Building; TLS US Army tanks rolling along street; TLS/MSs mounted squadron of 3rd Cavalry Regiment on street. National Recovery Act: MS NRA signs being positioned (or already in place) in store windows of a Jewish delicatessen, a restaurant, a barber shop, a clothing store, and a branch of the Pennsylvania Exchange Bank. Woman says, "I got a position at this bank after being out of work for two years and am I happy." Montage of Tennessee Valley Authority (TVA) projects: explosions, construction of dam, turbines, u-handle electric switch being thrown, electricity being distributed, TVA workers on telephone poles and transformers and transporters. 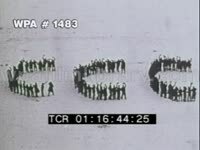 High angle LS group of workers forming "CCC" in field. TLS/MSs of Civilian Conservation Corps (CCC) marching about camp and into forest, uprooting field, fighting forest fire; TLS line of pack mules on trail in forest. WPA (Works Progress Administration) and PWA (Public Works Administration) projects: TLS workers tearing up road at construction project in unidentified city; MS sign for WPA work program in Minnesota; MS African-American man speedily laying bricks on road project; MS workers hammering wooden stacks into ground w/large mallets; MSs workers shoveling wet cement. WPA (Works Progress Administration) and PWA (Public Works Administration) projects: TLS workers constructing levee dam; MSs workers breaking rocks, cityscape in BG; MS PWA sign; TLSs bridges, including the Golden Gate Bridge. 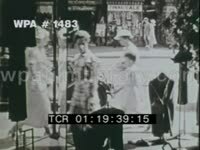 Montage regarding the welfare & depressed state of affairs of African-American community, 1930s: MCU African American woman standing on street corner; TLS/MS black men working on New Deal paving project with white men; MS black women sweeping doorstep; MS black man breaking ice; MS black woman brushing hair of daughter on stoop; MS young African American man using hose to water landscape plants; MS young male hobo on street curb; TLSs ramshackle homes of African-Americans in rural south, families sitting on front porch. TLS/MSs poor Caucasian family on front porch of shack (Appalachia?). 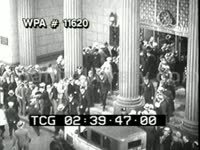 Great Depression: TLS panicked crowd inside faltering bank. TLS/MS men working board at New York Stock Exchange. GV inside brokerage office. Great GV stunt plane wobbling, descending, smashing through hoop obstacle. Great Depression: Several GV/MS somber white men standing in breadlines. MCU/MS men in the street eating bread & sipping hot drinks. Several TLS/MSs crowds of anxious depositors outside faltering banks, panic in the streets. Great Depression: LS pan small barren town in rural local. GV industrial mill at a standstill. TLS railroad yard filled w/ inactive cars. Traveling TLS along urban ghetto street lined w/ pushcart venders. GV men waiting in breadline. MCU elderly women being served at soup kitchen. GV white kids skipping rope on shabby stoop. MS two white male factory laborers arriving at work to find an empty guard station. Great Depression: Great GV/MS large rural white family eating supper at picnic table (Dust Bowl, Okies). GVs white female workers at Emergency National Employment offices (late 1930s-early 40s). 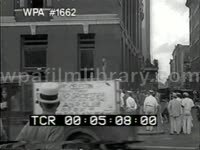 MS white men eating rations while standing on the street. MS grim white men being served in breadline. MS men receiving hot liquid & bread. MS Red Cross nurses handing out rations. MCU soup being ladled from pot. MS men & women standing in food lines. MS desperate woman strapping the bottom of pot for a bite to eat. Great Depression: MS President Roosevelt, flanked by members of cabinet including Sec. Of Labor FRANCES PERKINS, signing social security act. GV/MS poor white rural family gathered on front stoop of county home (Dust Bowl, Okies) TLS rural town w/ men gathered outside commercial establishment & boys playing ball in the street. GV front porch packed w/ children of varying ages, maybe an orphanage or group home (poverty). Dealers in Death Part 1 - Dust Bowl Great Dust Bowl montage: dust storms, farms inundated by dust and silt, cows and people choking in dust, farmer running dust through hands, farm family packing belongings up high on trucks and trailers and fleeing homes, Oakies, displaced and dispossessed Americans migrating. Dealers in Death Part 1 - Great Depression Shots of homeless men riding the rails, jumping trains, wandering from town to town during the Great Depression. LS idle smokestacks outside factory. Panning CU "No Men Wanted" sign on fence outside shuttered factory. 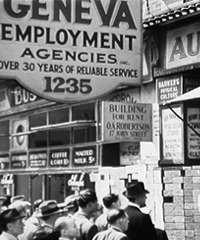 Unemployment, the Great Depression. MS older white man hammering "Closed" sign to wood fence. TLS several white men sitting outside store, most smiling, one man with young son; MS unemployed white men playing cards. TLS line of men forming, entering church or mission. MS pan of working class men, from boys to the aged, standing behind barded-wire fencing, waiting for work, almost all are wearing Gatsby caps. Great Depresion. Man wearing placard announcing, "Unemployed: Will Take Any Job", while walking on a busy city street. Men on a park bench (shot from behind them). Apple seller standing on street curb. Row of ramshackle shanties (Hooverville) in a field, city skyline in background. Haggard men warming themselves by a fire in an oil drum on street. CUs of signs, "Closed", "No Men Wanted", "Missionary Soup KItchen". Tired, unshaven men walking by camera. Men eating on a breadline. March 12, 1933 Franklin D Roosevelt delivering first Fireside Chat regarding the Bank Holiday. "The bank holiday, while resulting in many cases in great inconvenience, is affording us the opportunity to supply the currency necessary to meet the situation. No sound bank is a dollar worse off than it was when it closed its door I can assure you that it is safer to keep your money in a reopened bank than to keep it under the mattress. 25 Years Ago Today Franklin D Roosevelt toured the Midwest, returning from a Hawaii vacation, as large parts of the agricultural heartland were ravaged by searing drought. President Franklin Delano Roosevelt shakes hands from back of train; crowds wave and cheer. Drought scenes, dying and dead livestock. Men fill containers with water and transport them. Herd of (skinny) cattle.